Ho ho holiday collection! Artistic Nail Design has come out with a festive rainbow of a collection that will knock your socks off with its shimmer and shine! The Holiday Hangover collection is bursting with happy holiday colors that are easy and smooth to apply, have great coverage and even better drying time. I've come to depend on the excellent quality of this brand, and each shade comes in regular polish as well as gel polish. This makes the collection all the more versatile ! I can wax poetic all I want but words will never do these polishes justice, so let's just jump right in! 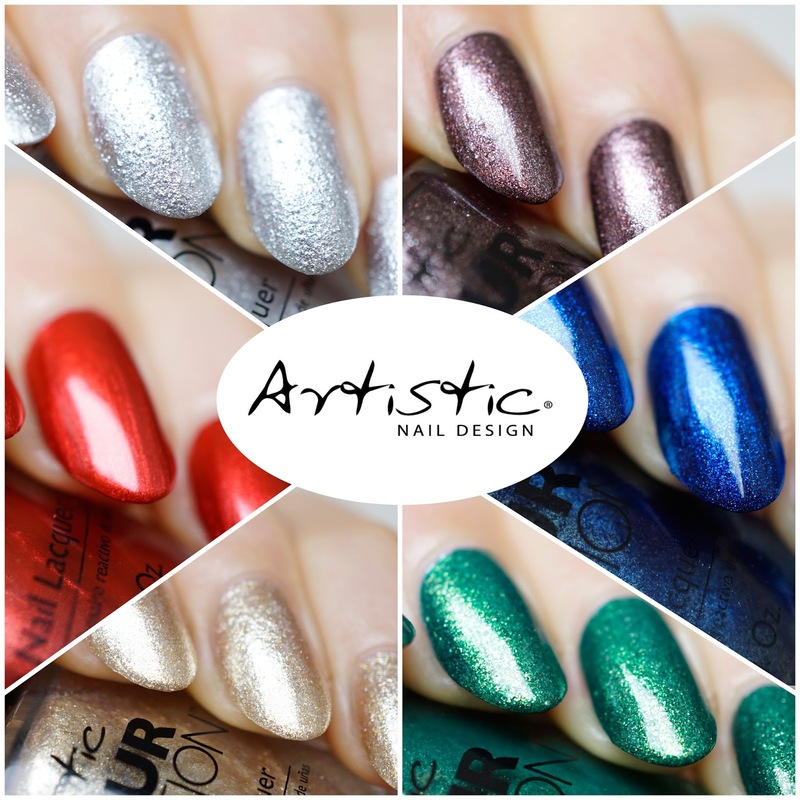 This polish is definitely Up To Snow Good ;-) The silver is highly reflective, any colored objects around will make it look like subtle rainbows. Also, it's slightly textured, as you can probably see in the pictures. It's not bothersome at all, just enough to give it a speckled look. I only needed 2 coats for opacity and it was smooth sailing all the way. You'd expect the texture to affect application but this was not the case. Let's Get Blitzin'd! Somewhere between a reddish brown and an eggplant purple, this shade throws me for a loop. Can't complain though, one thin coat looked pretty opaque already but I added a second one for good measure. It's so smooth and the finish is really shiny!! Bah Humbug is amazing! With only one smooth coat, this dazzling deep color is everything a polish should be. I really freaking love this one! 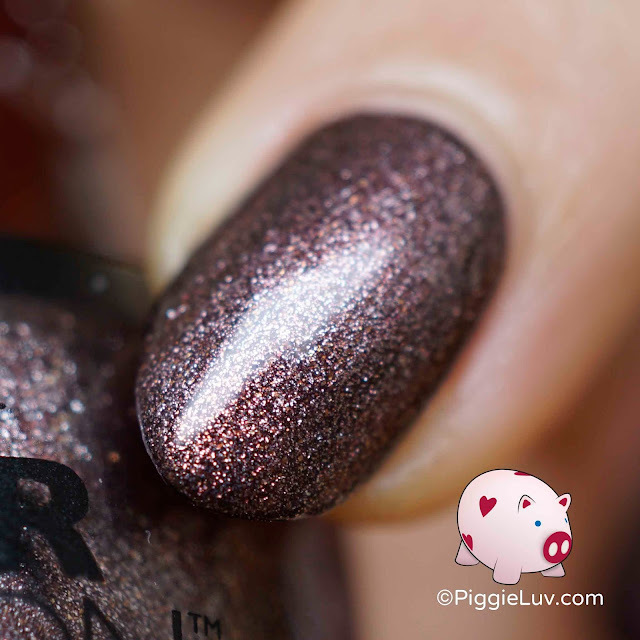 The shimmer gives it oodles of depth and a true wow-effect. So much better in real life than in the photos. What The Elf? I think it's a smidgeon of magic and a dash of holiday spirit! 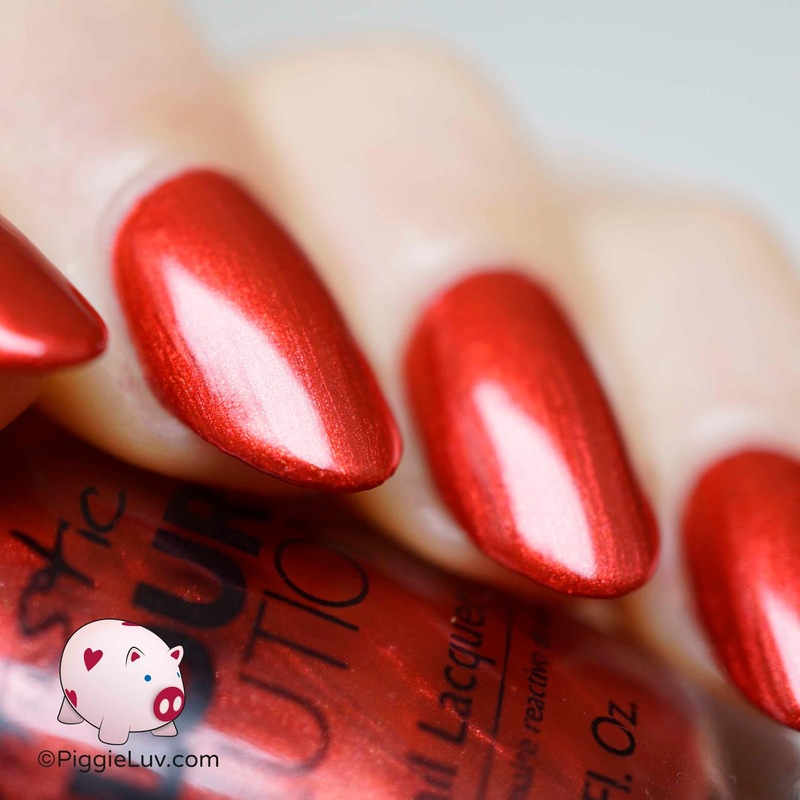 With 2 coats, this polish is easy to apply. I had my doubts about the golden shimmer at first, but it's less obvious on the nail than in the bottle. It actually works pretty well! When she does something, she does it right because This Girl Sleighs! Application looked pretty decent after 2 coats, but I applied 3 to lift it to a satisfying finish. From up close, it looks really interesting, as if tiny silver and gold glitters are working together to make it look like a whole. I'm not sure if I like the shade with my skin color but it's definitely festive! Like champagne! And it's over already... awww. I know how you feel. But don't worry, because come November 1st these babies go up for sale and you can grab them for yourself! Also, don't forget to follow Artistic Nail Design on Facebook, Twitter, and Instagram to keep up to date on new information and awesome inspiration! Thanks so much for reading, watching and maybe even commenting, and haaaappy holidays!